Spyros Bellas, Vice President at HHRM SA, presented the developments in Greece and 2019 roadmap for Greece’s E&P industry at the annual international exhibition Global APPEX (Prospect & Property Expo). The exhibition was organized by the American Association of Petroleum Geologists (AAPG) and was held from 5 to 7 March in London. 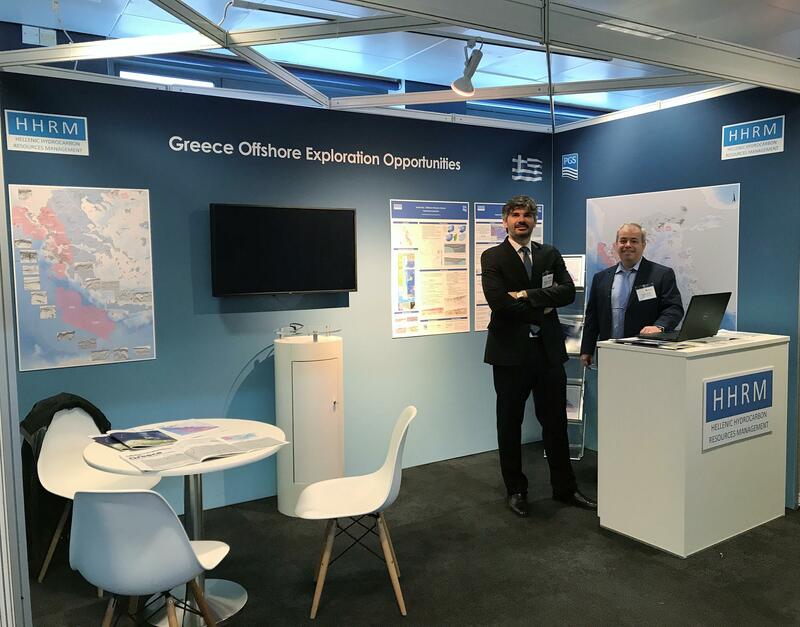 Besides this presentation, HHRM SA also ran an exhibition booth at this highly regarded exploration themed conference and exhibition, where visitors had the opportunity to be informed about E&P in Greece. There was a lot of interest, as developments in the Eastern Mediterranean have placed the wider area at the center of companies’ attention, and there are not many places left in the Mediterranean Sea where oil and gas exploration can be carried out. Ravenna will be the next station for HHRM, where the company will take part in the “Offshore Mediterranean Conference & Exhibition”, from 27 to 29 March. HHRM's booth at APPEX in London.